Get pregnant and everyone, everywhere will have countless pieces of advice to share with you. Most of it will be either annoying (listen, thanks for caring, but I don’t need you telling me not to dye my hair, I talked to my doctor and we’re all good) or easily Googled. Some of it will be entirely incorrect and out of date (those old wives tales your grandma keeps quoting are SO not real life). But, every now and then, they will hit on a gem that you might want to listen to. 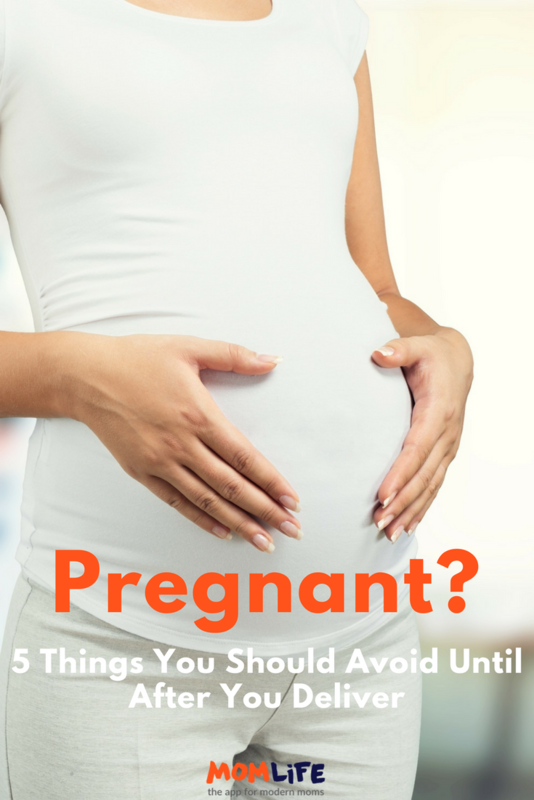 We checked out a few common don’ts for pregnant ladies and discovered these are totally true -save them until baby is born. We aren’t going to comment on the one glass of wine with dinner once a week scenario, but we will say that drinking alcohol while pregnant has been found to be harmful or even deadly to growing fetuses. According to the Centers for Disease Control, “There is no known safe amount of alcohol use during pregnancy or while trying to get pregnant. There is also no safe time during pregnancy to drink. All types of alcohol are equally harmful, including all wines and beer. When a pregnant woman drinks alcohol, so does her baby.” We say trust that and keep it sober until baby comes. The idea of slipping into a hot bath or soaking in the hot tub after work sounds lovely to your aching back and swollen feet, but unfortunately this one is a no go. Warm, totally fine, but hot enough to raise your temp above 102.2 should be avoided. Soaking for more than 10 minutes in water this hot whiloe pregnant can even cause birth defects in baby, particularly if done in the first trimester. While eating a nice plate of sushi or a sub sandwich can actually be quite good for you normally, things like this truly should be avoided while pregnant. Lunch meat has been known to be contaminated with Listeria, a bacteria that has been linked to miscarriage in pregnant women. Also bad, fish with high mercury counts, soft cheeses, unpasteurized milk, and pretty much anything raw that is in the meat, egg, or fish category. Lots of that stuff can be contaminated with Listeria and needs to be cooked dead for your safety. Like Motrin or Advil, although acetaminophen (Tylenol) is generally fine to take (ask your doctor before you take anything though, that’s our rule of thumb). If you’re down with a headache, consider rubbing lavender oil on your wrists, then have a rest in a dark room with a big glass of water -sometimes relaxation and hydration is all you need. Go ahead and push it off on someone else while you’re pregnant so you don’t risk exposure to Toxoplasmosis -a common disease that cats carry and can transmit to humans. If you contract it pregnant, it could lead to miscarriage, still birth, and birth defects. We know you won’t miss the task anyway. Find out how other pregnant moms are adapting to pregnancy in the mom.life app!